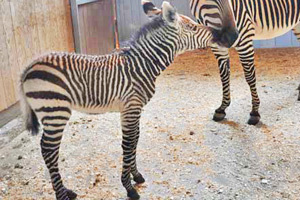 Kentucky’s Louisville Zoo is celebrating the birth of a female Hartmann’s mountain zebra foal. Hartmann’s mountain zebras are listed as a vulnerable species by the International Union for Conservation of Nature. The 72-pound foal was born to Morena, and her father is named Gibbs. She arrived at 2.45am on January 18. Zoo officials report she took her first steps at 3.15am and was nursing by 3.17am. The pair are said to be doing well. The foal is expected to be on exhibit for the public in the coming weeks, depending on the weather. The zoo’s Floyd Memorial Birthing Center will sponsor a naming contest in the northern spring. The zebra birth is a part of the Association of Zoos and Aquariums Species Survival Plan. Such breeding plans work to improve the genetic diversity of managed animal populations. The international studbook for Hartmann’s mountain Zebras listed the total population in 2011 at about 8300, with 177 in captivity. Studies indicate this number could decline by more than 10 per cent in the next 25 years due to an increase in hunting and loss of natural habitat to agriculture. Hartmann’s Mountain Zebras (Equus zebra hartmannae) are native to Namibia and most commonly found in the extremely harsh environmental conditions of the Kunene Region in the North West.